The Sony RX100 is a feature packed, metal bodied, pocket snapshot but can the brand's new high-end large sensor snapper make a big impression? Wouldn't it be great to achieve results close to what professional photographers can manage with all their much bulkier and pricier gear, using just a pocket-sized snapshot? Going some way to allowing you to do just that is the metal-bodied Sony Cyber-shot DSC-RX100. It looks the part thanks to a sophisticated all-black finish, neatly curved edges, plus a periscope-like flash that pops up automatically if it's too dark. The real talking point here however is what's inside: the RX100 features a sizeable 20.2 megapixel resolution from a one-inch CMOS sensor. That's four times the physical size of the 1/2.3-inch chip usually found in most pocket snapshots, which brings it level with the likes of the Nikon 1 series compact system cameras. Added to this, the camera offers a lens with a bright f/1.8 maximum aperture. Combine these two features and you have more light allowed in and a larger area on which to gather it, on paper at least, suggesting a real boost in image quality. Despite the ambitious premise, the Sony RX100 fields a typically conventional if streamlined set of controls. On the top plate we find a recessed on/off button and shutter release, the latter set towards the front and encircled by a lever for operating the 3.6x optical zoom. This offers a modest yet workable 28-100mm focal range in 35mm terms, lens gliding from wide angle to maximum telephoto in just over two seconds, sound-tracked by a low buzz. Set back, so it half shares the top plate and the back plate, is a shooting mode wheel. This has a reassuringly stiff action, preventing slipping between one setting and another when fetching the camera out of a pocket. The ten options here include creative controls such as program mode, aperture priority, shutter priority and manual mode, plus a customisable Memory Recall option. Naturally automatic modes are included too, here subject-recognising intelligent auto plus separate 'superior' auto – which automatically enhances images in-camera, as a sort of built-in Photoshop. Inevitably this slows the writing speed slightly. The backplate again features a familiar layout: video record button top right, function and menu buttons just below, a mode dial come scroll wheel in the middle and playback and delete buttons just below that. In a nutshell, anyone stepping up to the RX100 from a cheaper snapshot will only feel threatened by the Sony's premium price tag. Perhaps the coolest control here is the one it's easy to overlook: namely the RX100's lens ring. Give this a twist in one of the camera's auto shooting modes and you can alternatively use it to zoom in or out, focal range between 28 and 100mm displayed on screen. Use the same ring say in Program mode instead and you've the ability to manually adjust aperture and shutter speed via the same display. Press the function button first and then use this same ring, and there's the additional ability to scroll through effects filters, such as miniature, watercolour, illustration, toy camera and pop art modes. This reminded us somewhat of the Samsung NX's range's iFunction lens as found on the Samsung NX1000 and the rather similar lens ring on the likes of the Canon PowerShot S100. At first glance the LCD display that swallows up 4/5ths of the back of Sony's RX100 appears pretty standard: 4:3 aspect ratio, narrowing to 16:9 in video mode, cinematic black bands cropping top and bottom, and 3-inches in size overall. And, to be honest, when we switched on the camera we didn't notice the additional wow factor that a purported resolution of over one million dots might suggest; most similarly priced rivals now offer a semi pro camera-like 920k dots after all, so perhaps this is why our eyes weren't quite boggling at just over a thousand extra pixels. Still, in terms of spec this is the highest figure we've seen devoted to the back screen of a consumer camera; it's normally reserved for a separate electronic viewfinder on the likes of a bridge camera or super zoom. Suffice to say, viewed dead-on, the screen is clear, the picture crisp enough to enable the user to work out which portions of the image are sharp in focus and which aren't with narrower depths of field, though sunlight and the angle the camera is held at – particularly if you're tilting the camera upwards – inevitably affects visibility. For us it's still not quite a patch on the contrast boosting AMOLED screens utilised by some Samsung models, such as the EX2F. The Sony Cyber-shot DSC-RX100 is supplied with a NP-BX1 lithium ion rechargeable battery, a mains plug and adapter, but an actual standalone battery charger costs extra, which seems a tad stingy given the overall package cost. The battery then is charged within the camera. The amount of shots provided via a full charge is a respectable if not quite grounding breaking 330 pictures, though in fairness this is considerably better than the 200 shots offered by the competing Canon S100. A physically large sensor with a high pixel count usually requires a physically large piece of glass – in other words a big lens – in order to do it justice. Hence we have the slim bodies of the Sony NEX range, to take one example, stylistically hampered by front-heavy almost DSLR-sized lenses. The lens on the front of the RX100 is barely any physically larger than you'd find on a pocket snapshot with a much smaller sensor however. So can it really resolve all those millions of pixels and live up to the RX100's admittedly impressive headline specification? The answer is… almost. There's bags of detail, but what a brighter aperture like the maximum f/1.8 offered here can give you is some lovely DSLR-like shallow depth of field effects – by which we mean you get the subject pin sharp but the area just in front and behind them is progressively blurred. Thus your subject appears to jump out of the frame and the shot looks all the more 'professional' for it. Photo enthusiasts – and you'd have to be, to spend this much – will love this feature, so it's a major draw. In terms of video the RX100 is no slouch either, offering 1920x1080 pixels and stereo sound, though the positioning of the microphones on the top plate mean you need to be careful where you're placing fingers during operation. In all though, the RX100's performance gives us surprisingly little to complain about. 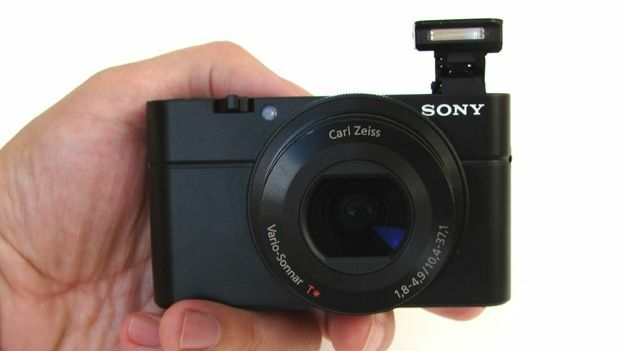 The premium 20.2 megapixel Sony Cyber-shot DSC-RX100 is lovely to look at, to hold and to handle. The underlying specification – bright f/1.8 maximum aperture lens, large sensor function adjusting lens ring, Full HD video with stereo sound – indicates the RX100 is pitched at the photo enthusiast as much as the fashionista. However, the hefty price tag would also buy you a competent DSLR or compact system camera. Samsung's recent NX1000, for example, also offering 20 megapixels plus an even larger APS-C sized sensor. Admittedly though, with Sony's RX100 there is less inherent compromise than most, which, along with its DSLR ape-ing performance for when we don't actually want to lug a DSLR around, takes some of the 'ouch' factor out of that asking price.